Galaxy S5 - Best Smartphone by Samsung !! When Samsung isn’t busy developing the world’s greatest smartphones and other electronics, it’s playing in the snow, literally. The South Korean tech company recently published a promo video showing the start-to-finish construction of a snowman. But this isn’t your typical Frosty The Snowman; Samsung’s version is contains three Galaxy S5 units: two for the eyes and one for the heart. Granted, Samsung’s attempt to build a snowman is somewhat creepy. With digital eyes and a digital heart, it doesn’t exactly look appealing. Then again, this video was likely shot for promotional purposes, which it succeeded it. “To celebrate the Christmas spirit, we thought it would be fun to bring some life into a snowman and give it a pair of moving eyes and a beating heart. Initially, we were going to use some Christmas magic, but we just decided to the water (or snow) resistant Galaxy S5 to do it. So… do you want to build a (digital) snowman? Great, because we’ve recorded the whole process. Check it out,” wrote Samsung on its website. You might be wondering how in the world Samsung was able to build a snowman using three Galaxy S5 units. After all, wouldn’t the snow and water damage the devices? While most mobile devices would likely suffer permanent damage as a result of being exposed to these conditions, the Galaxy S5 doesn’t. It’s designed with an IP6/7 dust and water-resistant body, meaning it’s able to withstand the snowman’s moisture. The durable outer shell protects the Galaxy S5’s internal components from moisture-related damage, which is pretty impressive to say the least. Although the Galaxy S5 is technically dust and water resistant, I wouldn’t necessarily place my device into a snowman. Call me crazy, but I’ve experienced too many damaged devices over the years. And with the Galaxy S5 costing around $600 (without a contract), I wouldn’t want to see my device damaged. Check out the video above to see Samsung create a snowman using the normal snowman-making materials (snow, carrot, etc. ), as well as three Galaxy S5 units. 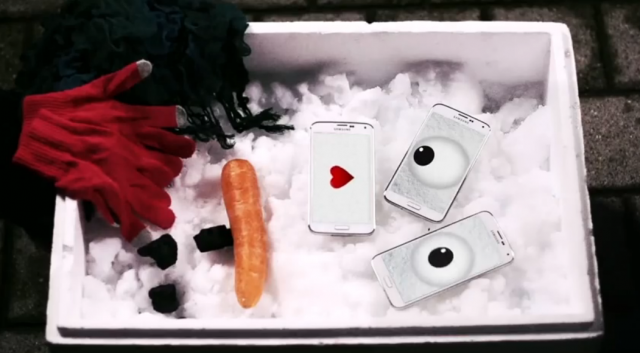 The 34-second promo shows the Galaxy S5 is able to withstand the moisture and ice. What do you think of Samsung’s G5 snowman? Let us know in the comments section below!